What Is The Game Bridge? I was asked this question just a few days ago. This blog, which is dedicated to providing free online bridge lessons for absolute beginners, seemed a good place to answer the question. Bridge is a card game. It uses a single pack of standard playing cards, without the jokers. You need four people to play bridge and they are divided into two partnerships. At the start of each game, all the cards are shuffled and dealt, so that each player holds 13 cards. These are then sorted by the player into the 4 suits - spades, hearts, diamonds and clubs. Bridge is a trick taking game. In each round of the game, each player plays one card. The person playing the highest card, or a trump card, wins the trick. Before the card play starts there is a round of bidding. One of the things the bidding decides is whether or not three will be a trump suit. If there is, which of the 4 suits will be trumps. All players must follow the suit played at the start of each round if they can. If they can't they can play a card from another suit. If there is a trump suit, a card played from the trump suit will beat cards played from the suit that was led (unless the round is being played in the trump suit). There are two distinct parts to each game. The initial bidding and the actual card play. Each require different skills and take time and practice to do well. 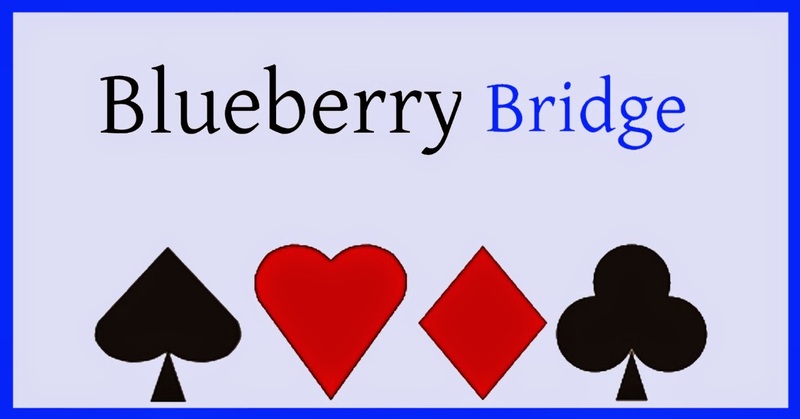 Welcome to Bridge Lessons - A Publication of Blueberry Bridge. On this site you will find 12 beginning bridge lessons for complete beginners wanting to learn Acol bridge. The first five lessons are the same whether you are learning Acol or American Standard bridge. They are the basics of the game. Lessons 6 - 12 relate to Acol bridge. Acol bridge is the system used in the UK, New Zealand and in a few other countries. Standard American is widely used in the rest of the world and online. If you are attending bridge classes and aren't sure which system you are being taught there is a simple way to decide. If your classes, online software or friends open the bidding with a bid of 1NT if they hold 15 - 17 points, then you want the Standard American lessons. If you are being taught to open the bidding with a bid of 1NT if you hold 12 - 14 points, then you want the Acol lessons. Work your way through the lessons by choosing from the menu on the right. The list is "upside down" with lesson 1 at the bottom. Sorry about that. a) The best place to learn Standard American bridge for beginners and improvers - No Fear Bridge US. b) The best place to learn to play Acol bridge for beginners and improvers - No Fear Bridge UK. Here you will find lessons graded from beginner through to improver with some advanced lessons too, to help you become a better and more confident Acol bridge player. What are you waiting for - learn how to play bridge today, or improve your bidding and play. There's a two week trial, with no credit card details required and nothing to pay unless you decide to join. The sites are run by an experienced bridge teacher and player who understands the needs of beginners and improvers and knows how to help you learn in a fun, interactive way with tutorials, quizzes, progress chart and hundreds (probably thousands) of interactive hands to play. New content is added regularly to help keep you interested and help keep you learning. Starting with the player to the left of the dealer, each player in turn must decide whether to open the bidding or to pass. Can you open the bidding? Each player has added up the number of High Card Points (HCPs) in their hand (see lesson 1). As a general rule a player needs at least 12 HCPs to open the bidding. (There are exceptions, but we'll learn those later). If the player to the left of the dealer holds 12 or more points, they can open the bidding. If they have fewer than 12 points then they pass. If you are playing bridge in your home or somewhere where there are just a few tables of players you can speak your bids. If you are in a club or larger gathering you will almost certainly be using bridge bidding boxes. This means you don't have to speak your bid - imagine the noise in a large bridge club if everyone was trying to shout their bids so their table could hear them! Once a player has opened the bidding they become the "Opener" and have started a dialog with their partner which is aimed at finding out the best final bid for them to make as a partnership. The player on the Opener's left must decide whether to overcall or pass and leave the opener and their partner to bid and make the final contract that the game will be played in. Now that you know how to decide if your hand is suitable for opening, head over to No Fear Bridge where you will find a tutorial on opening the bidding. Once the bidding has finished and the contract has been decided, the cards are played. The player to the left of the declarer makes the opening lead. As soon as the opening lead has been played, the dummy lays their cards face upwards on the table and takes no further part in the game. The declarer plays both their own hand and the dummy's hand. The game is played clockwise around the table. Each player in turns lays a card on the table. If the player has a card in the suit led by the first player then they MUST play the same suit. If they don't have a card in the suit that has been led then they can play a card from another suit. If the game is being played in a trump contract they have the option to play a card from the trump suit or to throw away a card from another suit. Each round is known as a trick. A trick is won by the team that plays the highest card in the suit that was led OR by the team that played the highest trump card. A card from the trump suit ALWAYS beats cards from any other suit. If the game is being played in a No Trumps contract then the trick is won by the team that plays the highest card in the suit that was led. After the opening round, each subsequent round is started by the player (or dummy) than won the previous round. The game is played until all 13 rounds or tricks have been played. The declaring partnership count the number of tricks they have won. If they have made the number of tricks they bid for, or more, they score the relevant number of points. If they have made fewer tricks than they bid for then the opposing partnership win the relevant number of points. You can practice playing the game of bridge by joining No Fear Bridge for your two week trial membership. Just click HERE and join today.